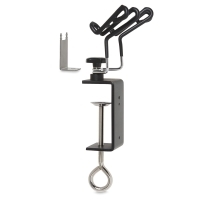 The Iwata Universal Airbrush Holder features two hangers to hold any combination of gravity feed, side feed, bottom feed, or trigger-style airbrushes. An improved hanger design holds airbrushes securely so they can’t be accidentally pulled from the hanger. Easy to adjust, the holder attaches to tables up to 3” thick with a heavy-duty clamp. 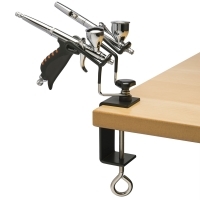 The Universal Airbrush Holder is also the base for rest of Iwata’s Workstation accessories — stand-alone products designed to work together. 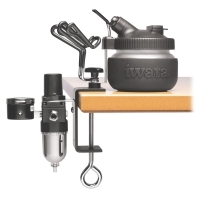 Add the Iwata Universal Spray Out Pot to expand your workstation.